Sample Photo Shown. Actual Product May Vary. All products ship FREE UPS Ground within the continental 48 states. For custom performance rotors, please allow 24-72 hours for your order to be shipped. Any orders placed on weekends or holidays, the shipping cycle does not start until the next business day. For additional shipping information, click on the "Shipping Information" link under the About Us section below. Cross Drilled and Slotted, Dimpled and Slotted Brake Rotors include a Lifetime Warranty against Warping and Cracking. Slotted Brake Rotors and Drilled only Brake Rotors include a 2-Year Warranty against Warping and Cracking. All Brake Rotors include a Lifetime Warranty against Material and Workmanship Defects. For specific product warranty information, click on the "Product Warranties" link under the Warranty/Policies section below. If you find a lower price at another website on a new, identical item, show us the lower price at time of purchase and we will beat it on the spot. Our guarantee is simple: call us toll free at 866-756-5536 tell us where you saw the cheaper price, make sure it is brand new, make sure it includes free shipping and find out what there warranty is against warping and cracking. We feel confident that no one can match our Price, Quality and Warranty. Speak To Our Brake Experts! 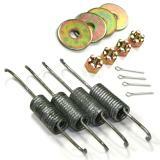 Each kit contains new return and retainer springs, pins, and any necessary hardware for your specific vehicle. 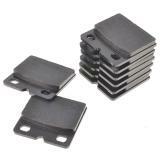 When installing Parking Brake Shoes, you should always check or replace the Parking Brake Hardware to ensure proper operation of your brake shoes. Each kit is tested and guaranteed to fit your factory specific vehicle. Each kit comes with a lifetime warranty against materials and workmanship defects. Includes all the necessary parts for your vehicle application. Guaranteed factory fit to original equipment specifications. Meets or exceeds original equipment factory safety standards. 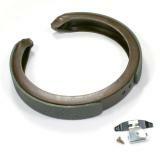 Designed and tested for each brake shoe application. Our Brake Performance Parking Brake Rotor Hardware Kit is made to the same fit and specifications as your and factory Hardware Kit. 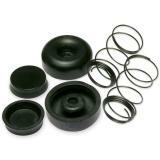 You can install the kit with no worries about factory fit or function. We do recommend you have a certified mechanic install them for proper fit and function. If you have any questions or need assistance choosing the correct Parking Brake Hardware Kit for your vehicle call our brake experts toll free at 866-756-5536. Photo Disclaimer - The Product Photo is for display purposes only. Actual product may vary in the assortment of parts. We allow our customers to return or exchange unused or defective items purchased from us as long as a request is made within 30 (thirty) days of receipt of product. Once the request is made, the product must be shipped back within 60 days, or the request will be void, and product cannot be returned. If you are not pleased with your purchase, you can return it for a refund so long as you follow the guidelines listed below. Once item has been installed on vehicle, it cannot be returned unless it is defective. A refund or exchange of a product will be processed only if it is accompanied by a copy of the original sales invoice/receipt. Unless the return is due to manufacturer defect or Brake Performance Error, the customer is responsible for return shipping costs, which are not reimbursable. All returned orders will be charged a 20% restocking fee. Any orders placed and subsequently canceled within the same business day will be subject to a $10.00 bank cancellation fee. Any order canceled on the next business day and beyond will be charged a 20% restocking fee. If an order is shipped and subsequently canceled, a 20% restocking fee will be charged if returned. No Returns after 30(thirty)days. If a product is refused upon delivery, we will treat it as a cancelled order, and the customer will be responsible for all shipping and cancellation fees. We will exchange any UNUSED UNDAMAGED item for another item of equal value. If the new item is of greater value, the customer will be responsible for any price difference. If new item is of lesser value, the difference will be credited to the customer's account minus the 20% restocking fee. The Customer is responsible for all shipping of exchanged items. We do not cover lost or stolen packages mailed back by the customer containing the parts being claimed under warranty. Because the customer is the shipper, he or she is the only one who can file any lost claim with the shipping company. Shipping charges both ways for any cancellations, returns or warranty claims outside the Continental USA, will be the responsibility of the customer. Brake Performance under No circumstances will pay for any shipping costs thereof. 1. Customer MUST have their order number with first and last name. We cannot accept any item for return without a valid order number or customer's first and last name submitted to an authorized representative of Brake Performance. To contact us please call us Toll Free at 1-866-756-5536 with reason for return. 2. Customer MUST return item(s) in original UNUSED UNDAMAGED condition. We cannot accept any returned item that does not have its original included parts, is not in its complete and sellable original packaging, or has already been installed. Any items that are returned, damaged, missing parts, or in poor condition will NOT be credited and will be returned at the customer's expense. For Performance Rotors, allow 2-3 business days before shipping in order to allow for the Custom Zinc Plating process. All other products ship out the next business day. On our shipping page, you will see a map that will show the UPS delivery times in the US. Can I select a faster shipping option? We offer overnight, 2-day, and 3-day UPS shipping. Our shipping options page will give you all of the different choices and costs. Expedited shipping options are not eligible for Brake Performance's Free Shipping. Is shipping to a different location possible? This is not a problem. Proceed to the customer information page and fill out the optional ship field in order for your shipment to deliver to a different location. Do you ship to International and APO addresses? Yes we do. Once you have filled out the "Customer Information" page, the next step is the "Shipping Option" page, which will give you all of the different shipping options and costs. Will all my packages arrive at the same time? All packages that relate to your order ship together from our warehouse. We use UPS as our freight carrier and cannot guarantee that they will deliver all packages at the same time. Do I need to sign for my delivery when my order arrives? All orders are shipped without a signature required. If you would like to sign for your shipment you must call us toll free at 866-756-5536 so that we can make the change to your order. After placing your order, an email is sent to you containing a copy of your order and order number. When your order ships, you will also receive an email from Brake Performance with your tracking numbers. You can check your delivery schedule on our website under "Order Tracking" and enter your order number, name, or email address to track your order. Alternatively, you can go to ups.com and track it from there. How does your lifetime warranty work? If you have an issue with any of our Lifetime Warranty products, simply ship the product back to us and we will ship you out a new replacement, no questions asked. Refer to our product warranties at the bottom of the page, under warranties and policies.